Add a quality new seating space to any office with this Ergonomic Drafting Chair. 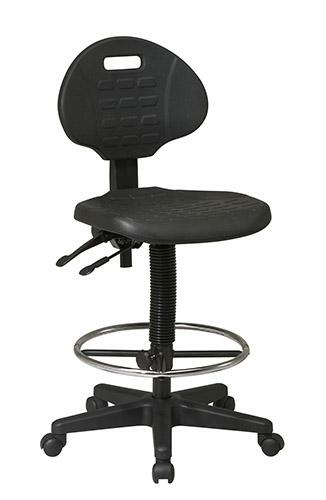 The drafting chair features multi task controls for seat and back angle adjustment. The drafting chair also features one touch seat height adjustment and a self skinned urethane back and seat. It is mobile on dual wheel casters, and supported on a durable nylon base. Seat Width: 19 In. Seat Depth: 18 In. Seat Thickness: 2 In. Back Width: 17 In. Back Height: 13 In. Back Thickness: 1 In. Seat Travel: 8 In.